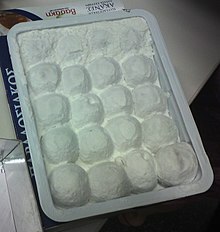 Akanes is a Greek sweet similar to loukoumi, only that it is flavoured with fresh goatsmilk butter rather than fruit essences. It is made exclusively in the town of Serres in Northern Greece. The name akanes dates back to the time of the Ottoman occupation of Greece, when it was called hakanes halva or royal halva (hakan deriving from the Turkish han and kağan). The sweet is available especially in the regional unit of Serres and in delicacy shops throughout Greece. Not to be confused with Akane. ^ "Η ονομασία του Ακανέ" [The name Akanes]. Αφοί Ρούμπου Ο.Ε. 2010. Retrieved August 11, 2015.